This lankmark Mike Caro hold ’em book is subtitled “The Complete Missing Aresenal” for a reason. Many of the concepts, strategies, and tips — power packed into its 400 pages — remain unknown to most serious players. Here is the ammunition you need to destroy any hold ’em game, anywhere. Based on Mike Caro’s world-renowned research and analysis, Most Profitable Hold ’em Secrets is a book that simplifies major-money, winning tactics as it prepares you to excel in your next game. Learn how to play profitable starting hands by seating position and discover, once and for all, which hands shouldn’t be played at all. Solid hold ’em analysis and advice, not guesswork. Armed with Mike Caro’s powerful hold ’em tactics, you can command your next table! Bluffing, betting, and even bankroll requirements made easy to understand by Mike Caro. How to handle bluffers. Page 122. Caro’s official starting hand rankings for all 169 hold ’em categories, listed by position! How to raise appropriately when you have to act first on the next betting round. Page 266. Image, aggression, flop, turn card (5th board card) and final river card advice for hold ’em. Caro’s latest hold ’em insights and winning formulas. The true value of eliminating players from tournaments when you have the chance. Page 384. 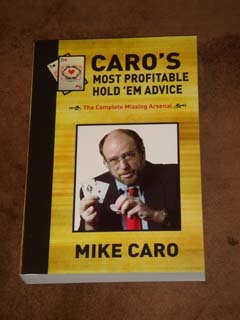 If hold ’em sometimes seems like a puzzle, then it’s been resolved for you in this single, astonishing Mike Caro textbook. Here is the hold ’em manual that can easily change the odds permanently in your favor, if you’re serious about winning. Mike Caro succeeds in teaching the science of hold ’em like no one else in history. And, in doing so, he makes your hold ’em success much easier. Prepare to be amazed!